Pigmentation, in skin terms, is the colour or melanin we see in our skin. A healthy young skin usually has very uniform pigment dispersal through out the body giving them a healthy glow. Treatments – Course of 6 x monthly initially. Hyper-pigmentation is a condition that causes premature aging of the skin. The skin no longer looks bright and healthy, but becomes dull, dirty and motley looking. It is a difficult skin condition to treat as there are quite a lot of factors that can be causing the hyper-pigmenation. Dedication and persistence is required both on the part of the patient/client and the practitioner. Why do I have age spots and discolouration? 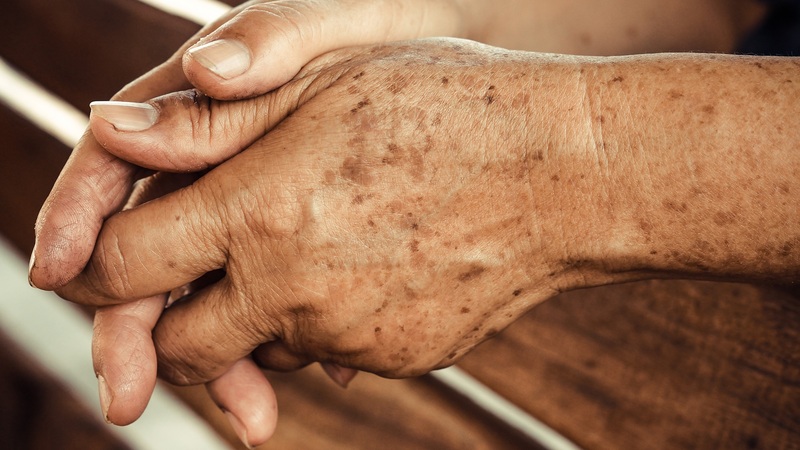 As we age our melanin producing skin cells, called melanocytes, can become damaged or imbalanced due to medication, hormonal shifts, genetic precursors, sun exposure and dietary deficiencies. When this happens conditions of hyper or hypo-pigmentation will appear. Hyper-pigmentation is commonly called age spots or pregnancy mask among other terms. Hypo-pigmentation is displayed in conditions such as Vitiligo. How do I fix my pigmentation? Your first step is to book a consultation with a Para-Medical Skin Therapist. Para-Medical Skin Therapists & Dermal Therapists have extensive knowledge of the skin, cosmetic chemistry and clinical laser devices. Experienced Para-Medical Skin Therapists, like Maree Andersen, have mastered the art of being able to match skin imperfections with the right skincare, nutrition, medi peels and laser treatments to gently and progressive achieve healthy skin confidence. What are the best treatments for sun damage? 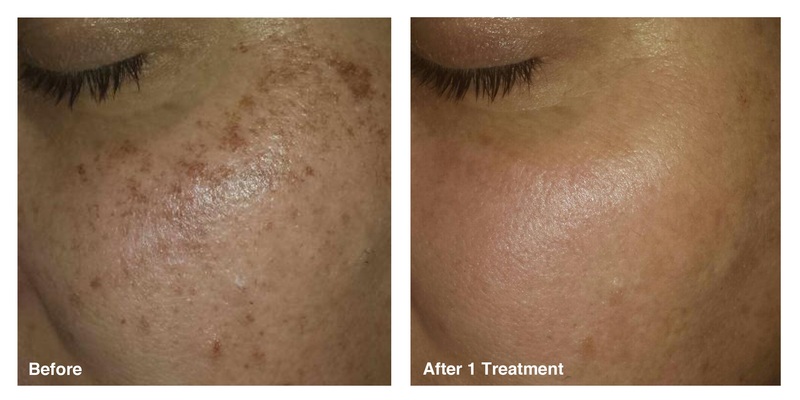 As sun damage is a surface skin condition it will respond well to laser pigmentation treatments. IPL and E Light pigmentation treatments will quickly draw the hyper-pigmented skin cells to the surface ready for exfoliation. After an intense pulse light treatment for pigmentation you will notice that the skin is a little hot and the colour will become darker. This is a good thing as it indicates the pigmentation is sun related and will be removed with home exfoliation in the next 7 – 21 days. How do I treat hormonal pigmentation? Hormonal pigmentation requires dedication and persistence as the condition will not correct with IPL, Fractional Laser or E-Light treatments. In fact heat based light therapies can in some cases cause the pigmentation to darken. Hormonal pigmentation is best treated with in clinic metabolic pigmentation peels and daily tyrosinase inhibitors or pigmentation blocking products. You will need to continue having pigmentation peels every 3 – 4 weeks and use your clinical grade pigmentation products indefinately as if you do not isolate the cause of the hormonal imbalance the skin will continue to over produce melanin.